Performix BCAAs, do they have some sort of fancy scientific edge? Better question – has there ever been difficulty absorbing amino acids? Oh snap, the charade is over! We recently did a follow-up review on Performix’s Ion Pre Workout compared to Ion V2X and Iridium Ion variations. With this purchase, we also decided to order up some of their BCAAs, named 9:2:2. Do these 9:2:2 BCAAs live up to the hype that the Performix brand works so hard to create? We’re not entirely convinced. Supplements live and die by their formulas and not their labels, Performix ISO 9:2:2 BCAAs are no exception. 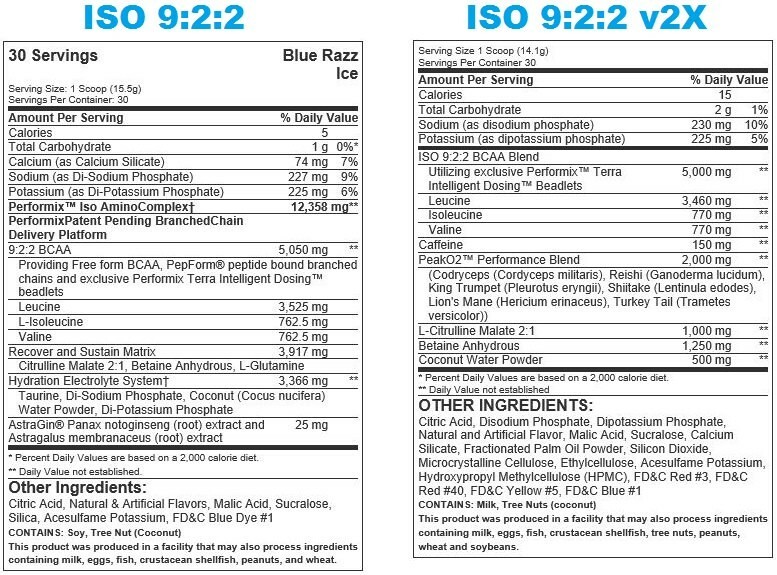 Performix’s ISO 9:2:2 BCAA was developed around 2016. There has been so much innovation in the supplement industry leading up to this time, that you would expect a really unique and cutting edge supplement. But instead, we have a 5,000 mg BCAA supplement in a 9:2:2 dosage. This is contradictory to what we found, which is that the ideal BCAA supplement dosage is 7+ grams with a ratio of 2:1:1. So, the next question would logically be does the terra bead technology help? See, terra beads are essentially enteric coatings for powder based supplements. The whole point of an enteric coating is to protect the encapsulated substance from stomach acid. We couldn’t find any research stating that stomach acid degrades BCAAs at all. This means, that ISO 9:2:2 are terra bead encapsulated for absolutely no reason other than marketing. Hydration Electrolyte System [3,366 mg]: Taurine, Di-sodium Phosphate, Coconut Water Powder, Di-potassium Phosphate. Panax Notoginseng extract and Astragalus extract [25 mg]. These extra perks add value to ISO 9:2:2, making the steep price of $46 (one of the most expensive BCAA supplements) burn far less. Based on the extra ingredients included in ISO 9:2:2, we strongly designate this as an intra-workout or pre-workout stacking supplement. Meaning, you take this during exercise or alongside your pre workout supplement before exercise… Whichever you prefer. In fact, we strongly prefer taking ISO 9:2:2 alongside Performix ION, as opposed to taking ION by itself. Performix ISO 9:2:2 is a bit of a disappointment, which leads us wondering how 9:2:2 v2X compares? Caffeine [150 mg]: To increase intra-workout energy. Note: this is not feasible for random recovery supplementation, unless you want that caffeine boost. PEAK O2 Performance Blend [2,000 mg]: Like that found in Staunch Koala Freak pre workout. Citrulline Malate 2:1 [1,000 mg]: This ingredient has an effective range from 6,000 mg to 8,000 mg as we discuss in our Citrulline Guide. Betaine Anhydrous [1,250 mg]: Betaine is a great ingredient for both performance and recovery. Betaine acts to both hydrate cells and grow muscle. Coconut Water Powder [500 mg]: Rich in electrolytes, even 500 mg of coconut water extract goes a long way. So, going from ISO 9:2:2 version 1 to version 2 we lose: glutamine, taurine, Di-sodium phosphate, Di-potassium phosphate, and AstraGin; but we gain: caffeine, Peak O2, and coconut water extract. Something interesting that we noticed, was that if you look at the other ingredients towards the bottom of each product… You’ll notice quite a few ingredients left out for V1 that are in V2… This is a mistake on their end, as all those nasty hydrogenated oils are the ‘patent pending terra-bead technology’. Yum? As you can already tell, we don’t recommend this BCAA very highly. Call us entitled, picky, or too focused on making gains… But we do not plan on personally purchasing ISO 9:2:2 again. It just doesn’t float our boat. Basically, the science doesn’t add up enough to support the hefty price-tag. By all means though, you can go out and try it for yourself. After all, we hate giving products negative reviews, so if you can shine any positive light on this product, it would be very much appreciated. So, what type of BCAA did we want to see here? Ideally, we wanted ISO 9:2:2 to contain 7 or more grams of pure, isolated BCAAS. That’s it, simple and clean. Instead, ISO 9:2:2 contains a myriad of under-dosed ingredients and unnecessary terra-bead technology.